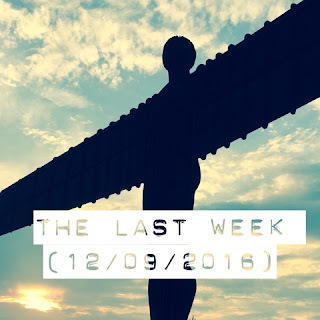 A bit of a break from the norm this week as I took a trip to Newcastle for work, anyway on with a quick overview of the past week. Monday - Another fast turn around seeing my little boy after work before heading out to play five-a-side football. I felt much better playing this week, probably down to the fact I was able to get some shots off and scored a goal! Tuesday - I spent the afternoon travelling to Newcastle-upon-Tyne for a work's meeting on Wednesday. Typical of my luck, just as I went to leave the heavens opened and a storm hit. Luckily, the weather wasn't too bad once I got moving and had cleared up by the time I got near Manchester. It's a long old drive to the north east from Shropshire, so I was glad to be able to sit down and tuck into a burger at 'The Fat Hippo', a recommendation from a colleague. I had a Gastro burger, two 4oz patties, topped with Parma ham, rocket and pesto mayo, very tasty and looking forward to going back on my next trip to Newcastle! A late night getting to sleep followed as I struggled with a caffeine rush, induced by drinking too much cola on the journey north. Wednesday - Not much to report from Wednesday as I travelled back from Newcastle, but I was lucky enough to watch the sunset on my journey home, I tried to take a photo of it, but by the time I could pull in to some services, the sun had disappeared. I was glad to get home and see my little boy (even if he was sleeping) upon my return. Thursday - A quiet night in recovering from the previous 2 days of travel, watching YouTube and catching up with my partner and son. Friday - I had fish 'n' chips with my Dad, partner and son in the evening followed by some frantic investigations to discover my five favourite cover songs and get a blog post ready for publishing. Saturday - I spent the morning watching TV with my partner catching up on the Great British Bake Off (Batter week) and playing on the Xbox whilst my son napped. In the afternoon I went to the football as Shrewsbury Town hosted Scunthorpe United, Town seemed to play better than they have done in recent games but they still lost 0-1. A lot of the chatter on Facebook was calling for the head of anyone concerned with the club. Although I like Micky Mellon, the manager, sometimes losing the fans can lead to the managers position becoming untenable. Hopefully he can turn it around and soon! Sunday - I spent the morning playing on Terraria (for what seemed to be the first time in forever). In the afternoon we when to see some friends and let our children run about and have some fun. Hopefully you had a good week too, I've not got much planned for the upcoming week but we'll see how it turns out.